Me Made May is fast approaching, and for the past several weeks I’ve been mulling over the challenge and if and how I wanted to participate. The idea of a challenge intended to “[improve] your relationship with your handmade wardrobe” is awesome but for me, it has always been an anxiety producing prospect. While its not necessarily meant to be a photo challenge or a competition of most me-mades, seeing others’ Me Made May contributions still made me feel inadequate or lacking. It made me more aware of areas of my wardrobe that I hadn’t made myself or closet staples that I was “missing”. This sort of inventory caused me to focus on what I was lacking rather than what I had made and loved already. I can very easily fall in to “all or nothing” thinking so the idea of focusing on handmade items for a month also made me feel a lot of pressure to make everything my family and I wore, which is not a realistic endeavor given my current phase of life and the other demands on my time and resources. And though I celebrated their Me Made May efforts, I also compared myself to my friends and the daily handmade OOTD photos they were sharing (and had every right to share if they want to). So while Me Made May in and of itself is a noteworthy concept, for me personally its been a social pressure that did not serve me. After reading Mending Matters a few months ago and thinking about the ways my family and I are trying to reduce our consumption and waste, I realized those efforts could tie in perfectly to my own Me Made May plan that would be in harmony with the original goals of the challenge and encourage a sense of abundance rather than scarcity. 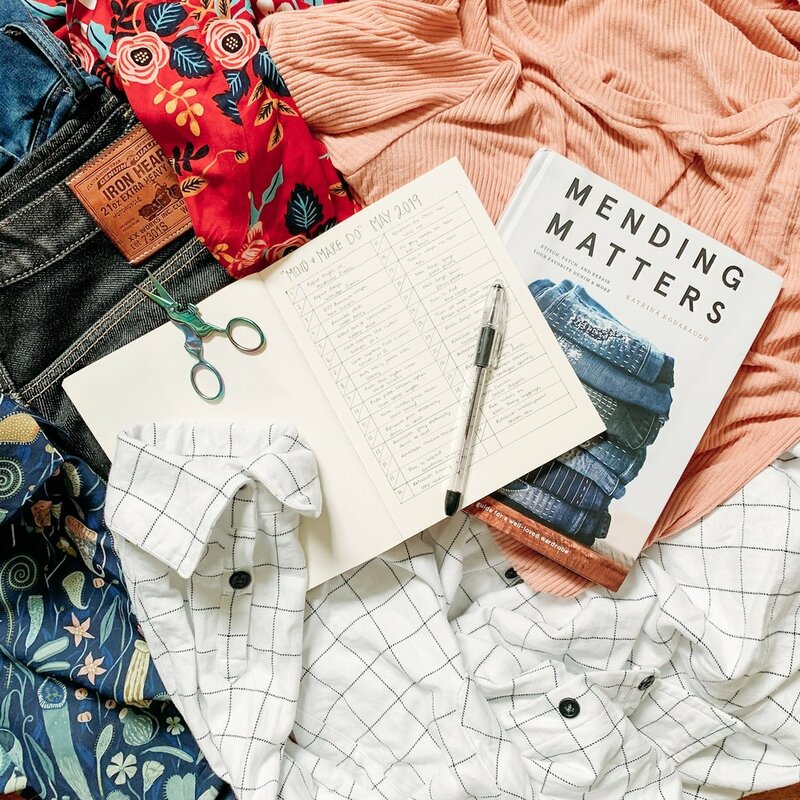 Each day in the month of May I will be mending clothes that have been well worn and still want to be worn, refashioning garments that would get more wear with some adjusting, and repurposing scraps into items that fill other needs my family and I have. I’ve created a list of thirty one projects that are manageable each day, and by the end of the month I’ll have a whole pile of revamped me-made (or me-mended) items that will get the enthusiastic use they deserve. I’m really looking forward to a month of “mend and make do” sewing. Like many of us, I often fall in to phases of FOMO and feel like I’m missing something if I don’t have the newest fabric or pattern or trendy shoe or etc. I also really like collections and its easy for me to want allllll of something—a tee in every color, a fabric in every color way, a version of anything in every option ever. I always thought I had a fairly grateful disposition, but I’m realizing I certainly span a spectrum of gratitude and sometimes find myself unsatisfied and wanting what others have instead of celebrating and maximizing everything that’s already in front of me. I suspect being more grateful for and taking care of the things I already have will have the dual effect of easing some of the anxiety and social pressure I feel as well. Think about how stressful it is when we think we must have something but we don’t—its very unsettling! It’ll be so restful to ignore that nagging compulsion for more. I feel like becoming more aware of just how much I already have will be a very freeing exercise for my mind, wallet, and footprint. If you’d like to create your own personal Me Made May pledge make sure to head to Zoe’s blog, So, Zo… What do you Know?, to check out what other makers are doing this year and to sign up yourself. Plus, grab a commemorative enamel pin celebrating Me Made May 2019 with 20% of the profits going to the non-profit, Labour Behind the Label! Having enough to be grateful for what I have, and having the resources to pursue minimal waste and less consumption also call into consideration the privilege I experience in my life. There is often a certain amount of privilege woven into creative community challenges (and more broadly lifestyle changes). Privilege in the making world is another detailed conversation of its own, but I at least want to acknowledge it and note that I am aware that and continually learning how my privilege impacts my creative opportunities.